The author Ha-Joon Chang is not anti-capitalist as the title might imply, but feels that we have been misled by free market capitalism. I was given this book and took it as a bit of a challenge as my son had brought it home after reading on his flight over from London, England. The challenge part was that I had to finish it before his flight back. Ha-Joon makes many many points and in a short blog I cannot do justice to them (I probably couldn't do much better in a long post). Although you have to twist your thinking in a number of ways it is not difficult to understand. I have always felt that the rules are made by those in power and that the masses (including myself) are easily or at least sufficiently won over to accepting their viewpoint of free market capitalists. Ha-Joon points out with many examples of how the thinking has been distorted. Born relatively rich (in the West) we tend to be very self-righteous that we deserve to be in power. The free market people in power say the market is supreme and corrects itself. In the most extreme beliefs, regulations are always harmful, government should be minimized, poor people are poor because of their own inadequacies. Their views on collective organizing is that it is really a dirty word--"socialism". "Government", to quote Ronald Reagan "is not the solution, it is the problem". History is re-written to prove their viewpoint. There is no such thing as a free market, or maybe I should say we don't actually have one. Originally a free market was conceived as one where a company was totally liable for their debts, meaning the owners had to pay all the bills even if that meant they would pay out more than they had invested. The invention of the limited liability (as you see with many companies adding Ltd. to their official company name) unleashed capitalists from the fear of unlimited debt. Quite rightly investors were interested to minimize their risk and society as a whole benefited. The free market believers usually overlook this fact and resent that workers want to minimize their risks. The truth is all countries reached their current level of success with practices that would not be approved by the free marketers, including their own countries. The United States, amongst many other nations strongly practiced protectionism to give their own industries a fighting chance to establish themselves. It is assumed that poor nations need to learn the new free market rules if they are to succeed. Ha-Joon points that in fact poor nations are actually much more innovative than richer nations. They have to be to cope. He gives the example of some people selling space in a long line. One experience that I recall was on a trip to Cuba taking a tour bus to visit Havana we were confronted with a deaf mute whose mastery of English I am not sure of. Actually met him on two different trips and at first found him very annoying, but eventually understood he was filling a need that a lot of us had. We couldn't figure out where our bus was parked. He had recorded all the bus numbers and knew where they were parked. He depended on us appreciating his service which not everyone did. One of the basic tenets of free market thinkers is that the market is rational, but actually that is not true. The more complex our society the more difficult it is to be rational. In truth most people at some stage trust what they are told. The system breaks down when trust breaks down. No single person understands all the options. Efficiency is easily abused. For instance money can be transferred in seconds from one project to another across continents. This has encouraged investors to seek short term payoffs and avoid those long term projects requiring patience. It has been assumed by most of us that shareholders have the strongest stake in a company, but actually they are not as committed as workers and suppliers who cannot switch their efforts so easily. Financing is a dominant force in the world. It can speed growth, but also create crisis. It tends to short term planning as opposed to long term planning. The author concludes (amongst other things) that we need to end our love affair with free market capitalism and to recognize that human rationality is severely limited in a very complex world. Now that we humans in charge of the planet don't actually need horses for transporting and fighting it is all too easy to forget about them. Fortunately humans get bored easily and don't have to spend as much time on survival activities as we once did. Although there are so many alternatives to being entertained, horses still can fit into a niche. For instance some of us like to watch movies (or television shows) of historical times. You don't have to go back past World War I to realize horses played a critical role in the military. 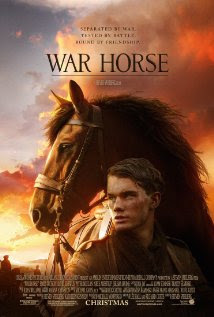 The recent movie War Horse, just nominated for an Oscar provided an occupation for a few horses and horse handlers. When I was much younger popular television programs were dominated by westerns. I grew up loving Trigger and Silver and others I can't remember and bugging my parent to buy particular cereals. A big area where horses are entertaining is racing. A car is impressive, but really you know it is not a live being. You also know it requires a key, a gas pedal and brakes. A horse on the other hand is a little more unpredictable and even frightening. As a young boy a friend's father took us to a thoroughbred race and I watched one leaning on the rail. I was overwhelmed with the speed and size of the horses. I really haven't been to the race track too many times, but have watched standard bred races as well and when you get closer they too provide a sense of living, breathing power. The Rider only deals with Quarter Racing which I have yet to see. Quarter horses are the fastest breed over a quarter mile so acceleration plays a big role. The big attraction with racing is betting. For a brief time in my life I indulged in some under age betting and was quite thrilled to win a few small bets. In university a friend of mine, Martin Weber (who went on to become a blueberry farmer and an usher at my wedding) had a system. There are lots of systems, but I would say his was pretty sophisticated. His system was based on the minimum payout being $2.20 on a $2 bet. That 20¢ legally required payoff could sometimes be disproportionately high compared to the actual risk. He put tough criteria on what an overwhelming favorite was and that boiled down to at most one or two bets a day and they had to be big and they had to be at the very last minute. He believed that someone who had inside information (read illegal) would leave their bet to the last minute to take advantage of long shot odds so he had to be careful not to get caught that way. In the end he took his system to the track, declared that it worked, but that it was too hard on his nerves. Working for The Rider the focus is often on English style show jumping, dressage, barrel racing and reining. When you appreciate the finer points a little better these are all very interesting. Show Jumping reminds me of golf (which I often get stuck watching with relatives that are active golfers) in a nice way. The tension builds up as riders take turns trying to get around a challenging course quicker and with fewer errors than their competitors. When it comes to jump off time the tension is very great at each jump. Barrel racing again is similar when you see a succession of riders (usually the faster ones seeded to go at the end) trying to trim a few tenths of seconds or even hundreths). Reining always has spins and slides that are exciting. I left dressage to the end because it has the most boring reputation. When you can appreciate that it can be very difficult to control a beast that weighs half a ton or so and get them to do very intricate maneuvers is amazing. When they add music to the mix it becomes an aesthetic experience. My favorite really is quadrilles when four horses are ridden in intricate patterns. Many of us can recall the RCMP musical ride which is just another pleasing variation. http://www.youtube.com/watch?v=frbETD7Eh74. I was fortunate to watch Mark Todd (an Olympic two time gold medalist from New Zealand) give a short clinic at the Royal Winter Fair. Vaulting is basically what you can see at the circus, but with a difference. In the circus they like to make easy things looks dangerous, but in vaulting the idea is to make difficult things look easy. Entertainment is one of the most desired goals of humans, but horses are more useful than just relieving our boredom or exciting our desensitized nerves. In future blogs I plan to write about how they are useful in police actions, logging, psycho-therapy and just for your human soul amongst other activities. Some of my readers may realize I make part of my living by selling ads for a horse newspaper, The Rider. Some assume I must have some sort of background with horses, but that is embarrassingly not true. My involvement with The Rider (Ontario's horse trade newspaper) came through a back door. I had spent almost 20 years working for mostly community newspapers in the circulation department. Later through a complicated chain of events I ended up representing an environmentally friendly cleaning company called TKO, later evolving to Orange aPEEL. That is how I met the Finns, Aidan, Barry and Katherine who ran The Rider and had bought a TKO territory. I loved working for newspapers and offered my services on a commission only basis even though I had no experience with the horse trade. Most horse people I tried to persuade to buy an ad weren't too concerned about anything other than how much it cost and how many people would read it or if we could help design the ad. Every now and then they would throw a few horsey words or phrases at me and I realized I didn't understand what they were referring to. Overcoming my embarrassment I asked a few questions, confessing my ignorance of horses and gradually learned a few things. That allowed me to feign some knowledge to a few other horse owners. You can't really sell what you don't understand so I got myself involved in reading books and even wrote reviews of horse oriented books for awhile. I attended events from time to time--Quarterama and the Royal Winter Fair and a few local events. Somehow I stumbled on Gord Westover who also didn't own any horses, but was experienced with them. A project I came up with was to write up about draft horses as I thought that would help break new territory. Gord expressed the most interest in this project with his focus on Shires. Shires are the largest horses and it turns out amongst the most gentle. I remarked once to Gord that most of the people I worked with didn't come anywhere near horses and I guess I was kind of lucky. He remarked that anyone who could get to nuzzle a horse was very lucky. I am still pretty much a spectator, but a very interested one. I do consider it a perk that to watch a lot of horses doing a lot of different things. I have learned a lot of interesting facts (and opinions) about horses and met a lot of fascinating people as well. I had been brought up to think of dogs as man's best friend and as an adult have become attached to my cats, but I can see that horses are more unique. They could easily have run away, but chose not to do so. That trust relationship has been very beneficial for mankind, but maybe not always so beneficial for horses. My father was a truck driver and once he remarked that he was the third generation of Teamsters. At the time I didn't realize he was including a great grandfather who managed a team of horses. I learned on my wife's side that one of her Ukrainian great grandfathers was also a teamster. Really it is easy to forget that we all had some important connections with horses in our ancestry. As horses have become a big part of my life I will be blogging about them and hope you will find it worth while reading about these most remarkable creatures we humans have been blessed to know. When you get to know them you won't find them boring. About the Photo: Gord Westover persuaded me to attend a show of Shires held at the CNE grounds back in August of 2000. He was aware of a particularly magnificent example brought in from New York state. Another detail I remember is that the owner, an older gray bearded fellow had a sign that said "The future of draft horses is Youth" and he kept the theme alive by employing a number of younger people. Anyway my camera flash refused to co-operate when I was given a chance to photograph the horse--Metherington Upton. So Gord, smart enough to know this would be a good boost for the breed asked the owner if the horse could be taken outside. They agreed. I don't feel my photograph does justice to this horse, but it is my favorite. One on looker drove through a stop sign while looking at the horse. 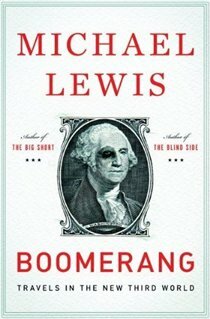 "Boomerang" is my second Michael Lewis book. The first was "The Big Short." The Big Short told about a few individuals who correctly analyzed the madness that was gripping American Financial circles. What makes sense today, did not make sense in the frenzy leading up to the 2008 crisis. In both books Michael is very good at digging out the short term thinking engaged in by most people and exploited by intelligent opportunists. Greed tends to be a short term drive where we want something now and don't worry about the long term consequences. Others exploit this modern human tendency often for short term benefits as well. Michael Lewis has a talent for getting people to trust him. He finds information at all levels. In "Boomerrang" the author travels to Iceland, Ireland, Greece, Germany and California. He has a tendency to stereotype nationalities as one way of explaining the different aspect of the financial crisis. Iceland is a country that is very literate and educated but for which most of the income used to come from fish. From my job I am well aware of another commodity, Icelandic horses, but that is another story. A few years back some educated Icelanders discovered international investments and felt they were smart enough to corner their share of the market. They borrowed massive amounts of money and bought a wide range of products all around the world. They got carried away and raised their standard of living very dramatically. They soon were involved in some investments that turned bad and eventually they owed more money than they could generate. An interesting side light is that the men who used to run the country have been replaced by women which the author thinks is perhaps an improvement. In Greece the problem seemed to revolve around the average Greek expecting all the modern benefits, and as is normal not to want to pay for it. Of the examples given they are the most adept at actually not paying taxes. They lowered pension requirements while also failing to increase money to pay the ongoing demands. One group of monks very cleverly became real estate kings. At the moment there are a lot of disappointed people. Not too long ago Ireland was touted as an example of free enterprise. Then they also over-borrowed, but in their case with more of an emphasis on buying Irish things. They soon found themselves in dire straits. At the heart of it would be American educated bankers. Germans are portrayed as very honest hard working people. They are very hurt that their hard work and honesty is expected to make up for the lazy and somewhat dishonest Greeks. But they too gave in to greed. They loaned for subprime mortgages in the States, to the Greeks and other Europeans without due diligence. Their problem was that it was much easier to seek opportunities among foreigners as Germans were not very likely to get involved with many of the financial instruments available commonly in the United States. Their leaders had promised that Germans would not have to bail out less virtuous members of the European Common Market. Now many feel to protect themselves they will have to do just that. California brought together a lot of thoughts in some graphic examples. Many cities have found themselves locked into unrealistic pension payouts, increasing employee wages and unable to raise taxes. A phenomena common around North America is how the police and fire departments are able to leverage each other for ever increasing wages and benefits. It has reached the stage where many municipalities are laying off police and fire personnel to dangerous new lows. In the town of Vallejo the fire and police departments are bare bones. At this point the author points out that now that there are few resources to work with, the Vallejo fire department is finding ways to be more efficient. One interviewee suggests that we North Americans (and too many others) have gotten so used to instant gratification that we have lost sight of the consequences. Examples of consequences include obesity, gambling and drug addictions. Using inflated real estate values houses are re-financed to give more cash. Credit cards are taken to their limits and restrictions are bent wherever possible. We cannot self regulate and of course there are political forces trying to de-regulate. Eventually the environment will force adjustments. In summary the only solution seems to be somehow to encourage long term thinking. In the meantime we all have to learn to live with the short term thinkers. Consumerism taken to the limits falls back on itself.